We want to offer data on Albanians and their level of impact by the Gospel. Please comment below to offer more or better data on particular countries or cities where Albanians live. Unless we mention it besides each country name, the rest of the countries have no known work among the Albanian diaspora there. Austria – 28,212. It’s an Albanian speaking group that has started meeting since 2016 in Vienna. Pray for Adriatik and Eda who lead the work there. Belgium – 80, 000 mostly living in Brussels, Antwerp, Ghent. Pray for Anduela who serves with an international church that she is able to meet and reach Albanians there. Greece – ~600,000 who went there after 91′ not including the Albanian Cam who have lived always there. There are several local churches/groups with Albanians in Athens, Thessaloniki and other cities. 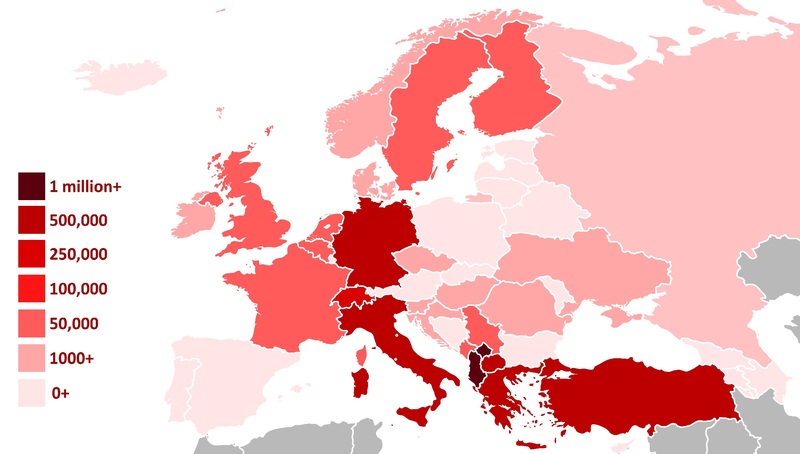 Italy – ~ 500,000 in addition to the 80,000-100,000 local Arbëreshë Albanians. Netherlands – 5,000-20,000 mostly the 2nd and 3rd generation of Albanians from Macedonia who arrived in 60-ties as guest workers. Switzerland ~ 300,000 Mainly from Kosovo and Macedonia the ALbanian community there is organized in several associations. There are 70 mosques and three Catholic centres. Turkey. up to 5 million. Unfortunately Turkey doesn’t recognize the minorities as it should and most of Albanians there will not be tracked statistically. No Albanian schools, although that there are up to 50 M.P.s in the Turkish parliament with Albanian background. U.K. – 30,000 according to census, but the number is expected to be higher. Albanians are the number one group who enters illegally in UK.